Biggest is not always best when camping. As a rule of thumb, buy the best quality, smallest tent that you can comfortably sleep in. While the huge 12-person dome tent may seem great value for money in store, it may turn out to be a nightmare the first time that you go to set it up. Before we get to discussing the right size tent for you, we first need to consider how a tent is used and the variations between tents. How do you use a tent? A tent is not like your house, or a caravan for that matter. You sleep, cook, eat, shower, bathroom, watch TV, and store your gear in a house or caravan. Basically, you live in it, only going outside when you need to. In a tent, you sleep, change your clothes and perhaps store some gear. Unless the weather is really foul, everything else is done outside or using other amenities. Cooking, eating, showering, bathroom and lounging around are all done somewhere other than inside your tent! Even if the weather is foul, you are still probably doing many things under a shelter outside your tent, rather than inside it. When you are looking at tents, be aware that tent manufacturers rate the size of their tents differently. A rule of thumb seems to be to allow approximately 200 cm x 70 cm of floor area per person, but there are variations. 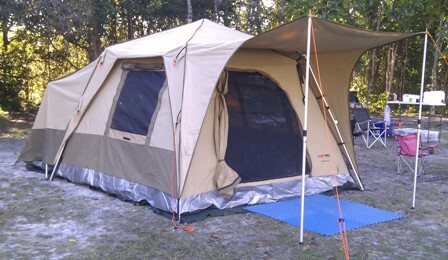 For example, a BlackWolf Turbo Plus 300 is advertised as an eight-person tent and has an area of 14.4 m². 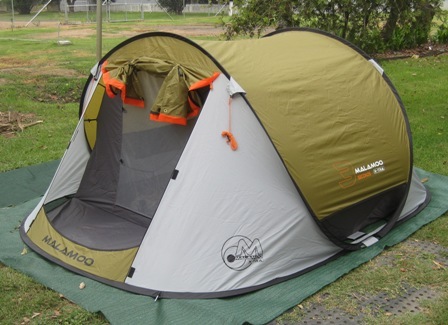 On the other hand, a Coleman 8P Instant-Up eight-person tent only has an area of 10.1 m². That is a massive difference in floor area for two eight-person tents! The primairy purpose of a tent is to sleep in, so make sure that your sleeping gear fits. There is no point in buying four super-deluxe mattresses for your family, only to find that when you stack them side by side, they will not fit in the tent! How big should your tent be? The size of your tent depends on many things. I know one guy who manages to get to sleep with his wife and four kids inside a six person tent. I know another couple who use a 10-person tent — for just the two of them! The limiting factor to using a big tent is the set up time, and that many camp grounds have size-limited camping sites. A massive dome tent will take forever to set up, whereas a small dome tent can take five minutes. Of course, you could use a fast setup tent such as the BlackWolf Turbo tents, or even a swift pitch tent such as a Malamoo 3-second tent. Several camp grounds I have stayed at have camp sites as small as 6 m x 6 m, so take this into consideration when choosing your tent size. On occasion, I have had to book and pay for two sites to fit my own tent! As a rule of thumb, I generally aim for tents that sleep around double the number of people that you will have. 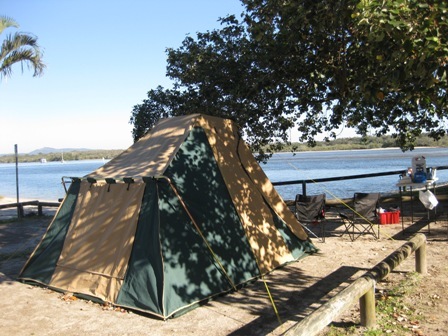 For example, if you are a family of four, consider six-person to 10-person tents. This will provide enough room for you to sleep, room to store some gear, plus some moving around room such as when you are changing your clothes. Hi Rex, great blog, just found it today! I have 3 primary aged kids, and we’ve just bought a wanderer escape instant tent for the kids, and my wife and I will sleep in the Black Wolf turbo lite plus 270, with all the bags, eskies etc. We used to have 2 dome tents but it would take an hour to set up camp and an hour to pack up. The integrated frame design of both the black wolf and the wanderer escape takes a few minutes to set up, and even with two tents, we thought it simpler than a great big 10 person tent. It also give us more flexibility when setting up in small camp grounds, and at El Questro we could fit in an odd-shaped area that the camper trailers couldn’t. We found on our trip that it was a pain to set up even 1 dome tent just for 1 night, such as at the Bungle Bungle caravan park, as we wanted an early start and packing up a dome tent is too much time and effort. We had to rent 2 safari tents that night, but in future the black wolf will be able to sleep all five of us just for an overnighter.